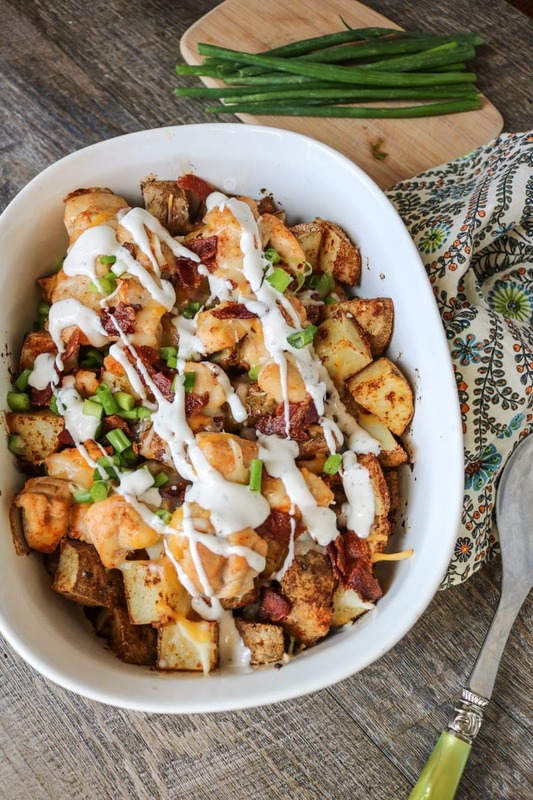 This Buffalo Chicken Casserole is made with layers of potatoes and chicken that are perfectly seasoned with spicy buffalo flavor, topped with crisp bacon, sharp cheddar cheese and finished with a creamy ranch dressing. I love Buffalo Chicken. Oh, maybe that is NOT such a secret, since I have recipes for Buffalo Chicken Pizza, Buffalo Chicken Tacos, Creamy Buffalo Chicken and Rice, and Buffalo Chicken Salad. Yep, the cat is certainly out of the bag!! And while my my boys love to dig into all things Buffalo, as I do, their all time favorite Buffalo Chicken recipe is my Buffalo Chicken Potato Casserole. This buffalo chicken casserole is not only incredibly hearty, but it is also full of flavor and spice. And it is extremely easy to make and budget friendly! Not to mention this Buffalo Chicken Casserole it is a complete meal in one dish. Step One: Mix together potatoes with oil and seasonings in large bowl. Step Two: Pour potatoes into large casserole dish and bake until tender at a high temperature, which allows these potatoes to get crispy, like oven fries. Which makes this dish sort of like loaded cheesy fries–but acceptable for dinner. Step Three: In the same dish you mixed the potatoes with the seasonings, mix the chicken with an additional tablespoon hot sauce. Step Four: Add the chicken to the potatoes and return to the oven at a lower temperature to let the chicken cook. Step Five: Remove the buffalo casserole from the oven and top with cheese and bacon. And return to the oven to melt the cheese. Step Six: I love to serve this homemade buffalo chicken with my homemade ranch dressing. I typically use russet potatoes for this casserole, because I always have them in my pantry, but red potatoes or yukon gold potatoes work as well. I recommend Frank’s Red Hot Sauce for the optimum flavor, but any generic brand of this hot sauce works too. Just don’t substitute it with Sriracha or another blend of hot sauce. If you don’t want to precook your bacon before adding to the casserole, add the bacon along with the chicken in the baking process. The bacon won’t get quite as crisp, but it will still cook through. Sharp cheddar is my preferred cheese in this easy Buffalo Chicken Bake, but mozzarella, Colby or provolone all work. My favorite way to serve this Buffalo Chicken Casserole is with a side salad both topped with homemade ranch dressing. 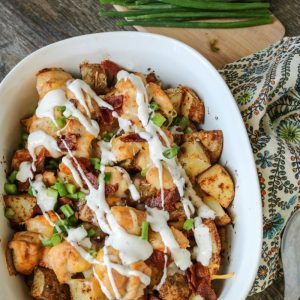 Seasoned potatoes and chicken are baked together with cheese and bacon for a hearty, flavorful family dinner. Mix potatoes together with oil, 1 tablespoon hot sauce, and dried seasonings in large bowl. Dump mixture into a 9x13 pan and bake for 45 minutes. In the meantime, mix chicken with the remaining 1 Tbs of Red Hot Sauce. Turn the oven to 375 and top the potatoes with chicken. Return to oven for 20 minutes. Remove casserole from oven and top with cheese and chopped bacon. Return to oven once again until cheese is melted--no more than 10 minutes. Serve with ranch dressing to cool down the heat. Yea!! I am so glad your family enjoyed it!!! My husband would love this meal! It’s comforting and filling and full of flavor – love the ingredients! It is totally one of my husband’s favorites. I hope yours enjoys it as much as mine does!! Oh my goodness, this sounds absolutely delicious! What a gorgeous and easy meal, I love the spicy factor!!! We love to use potatoes when we can. It really fills up the boys and they love them any way I make them. They are going to love this recipe! I totally get that–potatoes fill up my boys too!! And this is always a winner at my house! This sounds delicious! And easy – I’m loving the whole flavor and dump and bake dealio! This is right up my alley. I could eat buffalo chicken all day long…I am addicted to it. Definitely need to try this! My son the culinary student loves to make sauces and buffalo style is one of his favorites! I am send this his way to see if he will make this for his “turn” at family dinner. Sounds delicious! Oh you lucky Mom–let me know what he thinks! I just love a healthy, one dish meal! This looks fantastic! Thanks Lauren–I love one-pot wonders as well! This sounds so good but the only problem is that my husband and I can’t handle the spicy stuff, so what would be a recommendation for an alternative flavoring base to substitute for the hot sauce. Well Cheryl, you are not alon in not being able to handle spicy foods. My daughter HATES spicy food–so I always make a small ramekin just for her. To cut back on spiciness of entire dish I would omit the chili powder and only use 1/2 tablespoon hot sauce. Also cut the garlic powder in half. That should take this down a few notches but still have tons of flavor! Enjoy! I have to draw the line here. This looks like the kind of thing that’s so good. I’d never stop eating it until I’d eaten the entire thing. Do you cook the chicken first? or throw the chicken on top of the potatoes raw? This was so easy to make, yet had so much flavor! There wasn’t any left at the end of dinner. That’s how I know it’s a win! That’s always the sign of a winning dish for sure. So glad you enjoyed Julie. I can’t believe id never thought of making a casserole with buffalo chicken! Buffalo seasoning is like my most favorite thing ever! I have this in the oven right now and I can’t wait to have it for dinner in a bit! It was so easy and I can already tell its going to be a favorite recipe in our house! !